I found this gem by researching places for sashimi grade salmon. My old boss and I use to go shopping at the north London branch for noodles. The branch I’m reviewing is located in St James, and it was my first time here. I felt rushed to order my sushi, and the place can be cramped at lunch times. 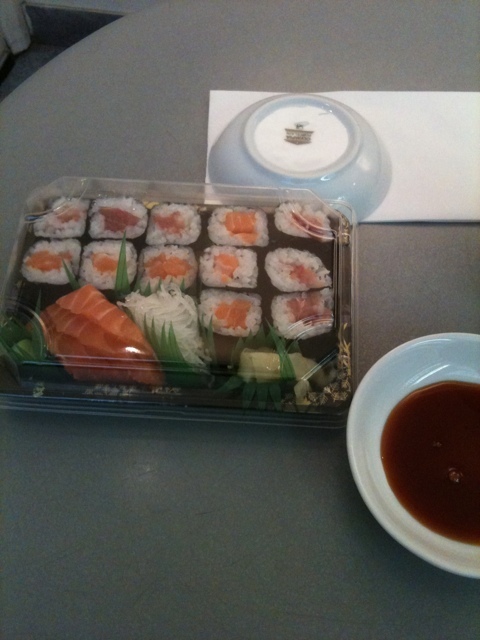 It was totally worth the 20 min wait for my food, I ordered tuna and Salmon maki £1.80 each and salmon sashimi. The salmon and tuna was so fresh and top quality I have heard Atariya is fish supplier for the notorious Nobu restaurant. If you can get pass the cramped seating and takeaway box presentation and just want great quality food for cheap prices. I highly recommend going here. I’ve been here too and found it amazing. It was a while ago, but I think I ordered a lot of avocade sushi (can’t get enough of it 🙂 ). To save money I often use vouchers sites like this (http://www.lovemyvouchers.co.uk/hungryhouse.co.uk/#1) when I order a takeaway because sushi can be so expensive! Thanks for visiting, I highly recommend the place. Have you tried the fatty tuna?